Sharing our objectives in public, said the sales coach, would make us much more likely to achieve them. It was a cold January day in Toronto, and my employer had gathered us for a session on effective goal setting to start of the new year. Before I knew it, I was put on the spot in front of my colleagues. What would my personal challenge for the year be? My heart rate went up, my thoughts raced. And then I heard myself say these fatal words: "I will run a half marathon this year." The room grew silent. Snow fell outside. Even before said snow had melted, I found myself on treadmills, and soon thereafter panting along the Lachine canal. I had originally started running during my half-year in Chile, where no pools were available to support my usual swimming regime. Ever since returning, though, my running shoes had only been in sporadic use. No more. With the September 21 deadline of the Montréal Marathon slowly, but steadly approaching, I had to get going. My endurance and pace were nowhere near what it would take to complete the 21km in a respectable way, so an improvement in performance was clearly required. Any Google search, not to mention a question to a certain more athletic family member, would have produced a plethora of training programs. But that would have gotten me dangerously close to all the über-equipped wannabe Haile Gebrselassies with their compression pants, heart-rate monitors and GPS watches. I might have set myself an objective, but I wasn't going to go that far. Instead, armed with Old Navy's finest athletic wear and a hydration belt, I started gradually extending my loops along the canal. As the temperatures rose and summer came, the kilometers started adding up and, much to my surprise, I became rather fond of my jogs by the water. Rumor has it that there may have even been the odd extra early wake-up, in order to squeeze in a little 15km before heading out to work. There was something satisfactory about getting to the office knowing that the day's exercise had already been done. When travel put a dent into my newly adopted running routine, I started growing anxious. How would a week away impact my gradual progress? How much of a distance penalty would that period of inactivity put on? Yes, running was not a matter to be taken lightly. And then the leaves started turning. Summer had come to a close, race day was near, and the furthest I had gone was only 18.5km! The pace was decent, but it came with a kilometer-long walking break in the middle. And unlike my training loops, the real race course would have a nasty little climb on the last 2km. I was feeling nervous, and when asked by my colleagues (they'd all been in that fatal goal setting session, remember), I started giving myself a bit of wiggle room by stating that in case of inclement weather, I'd really not go. After all, the real benefit was in the preparation, right? Utter nonsense, of course. After a summer of running, it was all about the race. As if to test my resolve, race day started grey and rainy, but that did not discourage me from making it to the start line on the bridge high above the St-Laurent. Surrounded by 15'000 other racers, I eagerly awaited the starting shot. And then we were off - a massive swell of runners, single-minded in their objective. This human stream cought me, and it felt like it pushed me forward and onward through the rain and past one kilometer mark after the other. Before I knew it, I had passed the half-way point, and as the course left the twin islands in the river and returned to downtown Montréal, the rain stopped and crowds started appearing along the road. They cheered, shouted and held up placards eliciting sweaty smiles. 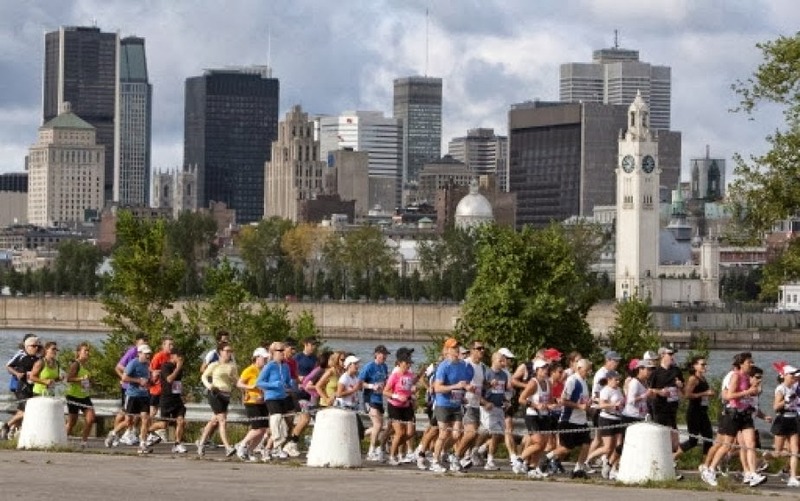 When I reached my typical slow-down point around kilometer 15, I was encircled not just by plenty of other participants, but also by countless spectators in Montréal's old port. And who would want to be the one slowing down under such circumstances? So I kept running. And running. And just a little bit more. And here's that final uphill stretch. And that wasn't so bad now, was it? And there are a hell of a lot of people watching on this last stretch. And why couldn't I have kept my mouth shut in that goal setting session? And... could this really be the finishing line down there? My dad used to keep all his medals dangling from the heating pipes in our basement. Next week, on a brief stop in Switzerland, a new medal will join that collection. Goal achieved.